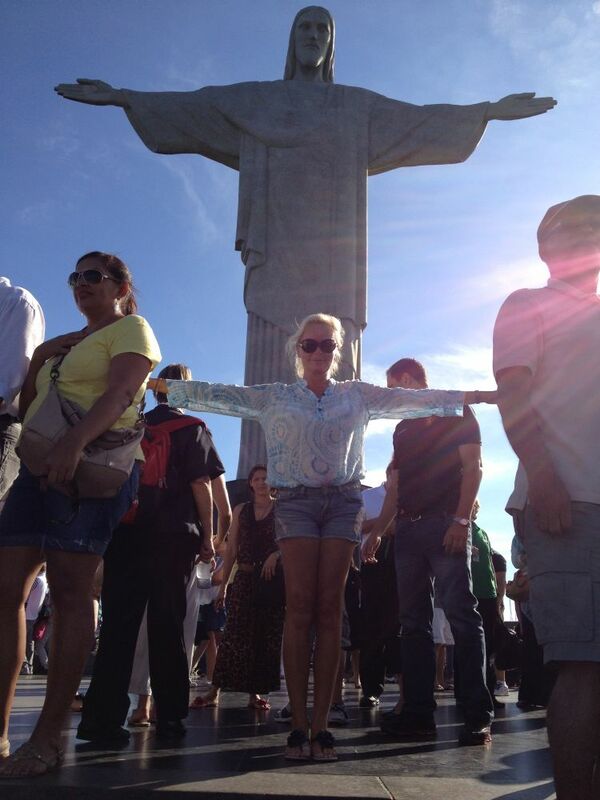 Standing 710 meters high, Corcovado Mountain is situated in the Carioca Range and overlooks the city of Rio de Janeiro. From the nineteenth century it was a frequent destination for those wanting to enjoy the views of Rio de Janeiro. The Corcovado railway was built in 1884 using an innovative cog system that was brought to Brazil from Switzerland. It was 3827 metres long with four stations, the fourth one only 40 meters below the summit. 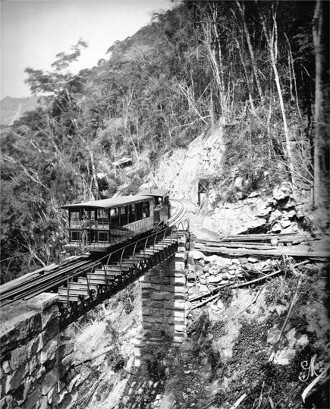 In 1906, shortly after the installation of electric street lighting and tramways in Rio de Janeiro, Corcovado railway became the first electric railway in Brazil, raising the annual passenger numbers to about 48,000. In the early 1920’s, the Catholic Church, which had effectively ruled Brazil since the 1550’s, was starting to lose the support of Brazilian citizens, who were coming under socialist political and economic influences from Europe after The Great War. 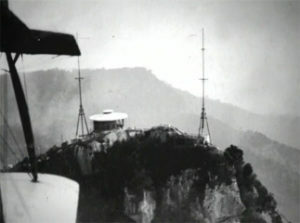 It was eventually decided that Corcovado Mountain was the perfect spot for the monument. Many designs were put forward for this prestigious project, but the architect and engineer Heitor da Silva Costa won the commission. His initial vision of Christ was a standing figure, holding a large cross with one hand and a globe in the other. In February 1922, President Epitácio Pessoa received a petition signed by more than 20,000 women supporting the erection of a statue of Jesus Christ on Corcovado Mountain – prior to that, the project had been delayed by the Protestant Church and other religious groups complaining that the statue was conceived and backed by the Catholics. However, after seeing the petition, the President informed all groups that if they had come to him first with a similar idea, then they would have been granted permission. So the erection of the statue would go ahead as planned. 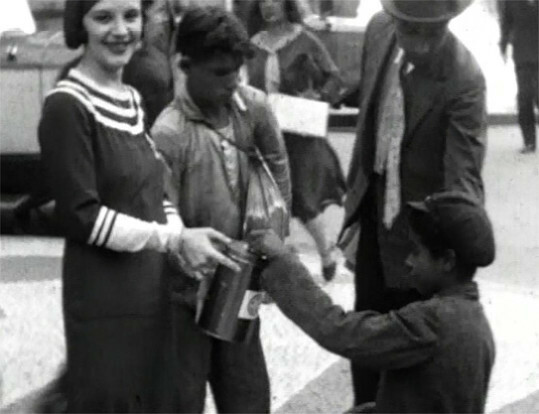 In September 1923, a fundraising event called ‘Monument Week’ took place, and in only seven days over 100,000 réis was raised, half of what was needed to build the statue. Heitor meanwhile, began to finalise his plans. 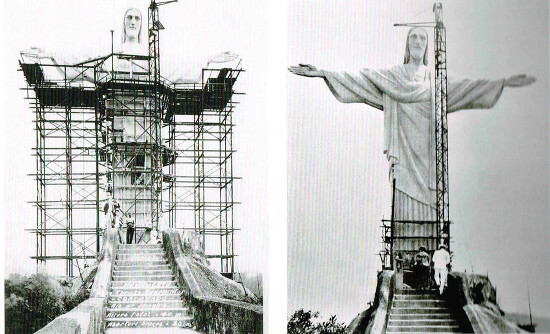 He was inspired by radio antennas atop Corcovado Mountain to alter his original design, so that the figure of the Christ would form a large cross of 40 metres high by 40 metres wide across the arms. He selected a rocky area right on the summit as the perfect place for Christ to look down from. In 1924, Heitor contacted the great master of structural engineering, Albert Caquot, in Europe to help find a sculptor who would be able to make the final scale model. He then met with many sculptors in Paris, Munich, Florence and Rome and eventually decided to work with the renowned sculptor, Paul Landowski, in Paris. 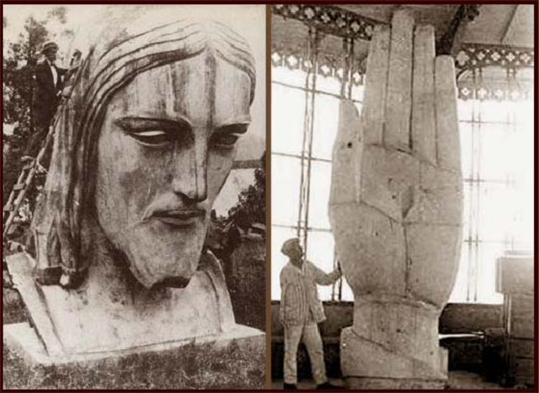 While Landowski was busy making the moulds for both the hands and the Christ’s head, Albert Caquot was putting the finishing touches to the plans of the structure in reinforced concrete. Hand length: 3.20 meters with the distance fingertip to fingertip 28 meters. The total weight of the structure would be 1,145 tons, with the head weighing 30 tons alone and each arm weighing 80 tons. Heitor was keen to express to Landowski that the head and hands would be seen as a work of art – a sculpture – and the body and arms as architectural work. He commissioned him to construct a 4 metre replica of the statue. 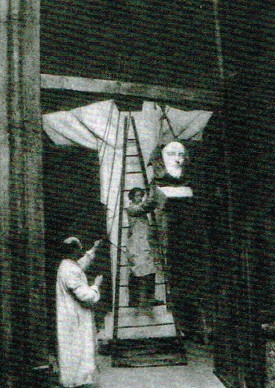 This photo shows Landowski in his new studio on Boulevard Saint Germains where he sculpted the 4 metre model. Now that construction was underway, Heitor’s next problem was coming up with the external finish for the statue. He knew the reinforced concrete wouldn’t provide the artistic look the structure demanded. And in 1927, Heitor came across the perfect solution by chance – in a Parisian fountain he saw the walls were lined with a mosaic of small, triangular silver tiles. His immediate idea was to coat the outer shell of Christ with thousands of small ceramic or stone triangles. Within 24 hours, he had had several samples made at a local ceramic studio, of different sizes and using various materials, including soapstone. Soapstone was widely used in the churches of Brazil, as it was readily available and because its colour never fades, it is resistant to the rain and sun, and does not expand or contract with changing temperature. 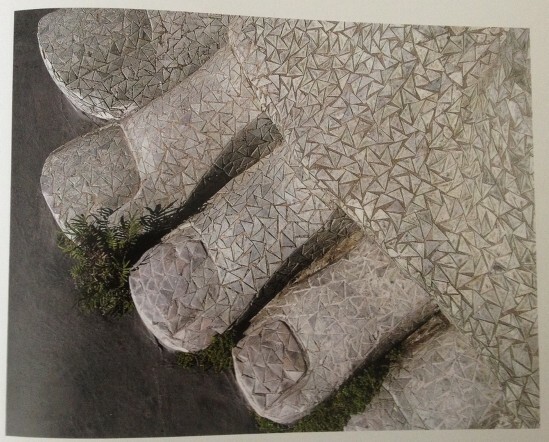 Heitor decided that it was the perfect material for the mosaic he was proposing. The idea was brought back to Rio de Janeiro, where society women met frequently in churches to stick the soapstone triangles onto sheets of mesh, which would later be used to cover every part of the Christ’s body, apart from the head and hands. It is said that some wrote the names of loved ones on the back of the tiles before sticking them down, sealing their love forever. The construction of Christ’s body began in the middle of 1926 under the supervision of Heitor’s fellow architect, Heitor Levy, and engineers Antonio Ferreira Antero and Pedro Fernandes Vianna da Silva. Christ the Redeemer was inaugurated on October 12th, 1931, which followed a week of festivities called ‘National Christ the Redeemer Week’, as people from all corners of Brazil started to arrive to see the masterpiece. Christo Redentor, or Christ the Redeemer as the rest of the world know it, recently celebrated its eightieth birthday in 2011, and has gone on to become one of the new modern ‘Seven Wonders of the World’, with nearly 2million visitors each year.